I’m not a big fan of green teas. I dislike their floral, grassy taste caused by chlorophyll. While at home I prefer kung fu cha in yixing teapots, I also believe, that green teas are best prepared in gaiwan or bigger teapot. That’s why I drink green teas mostly at my work prepared in tetsubin. But once in a while I afford a good quality green tea. Today was quite hot out there, so I wanted to end the day with lighter fresh tea. It’s hand processed tea made from tip and top leaf. 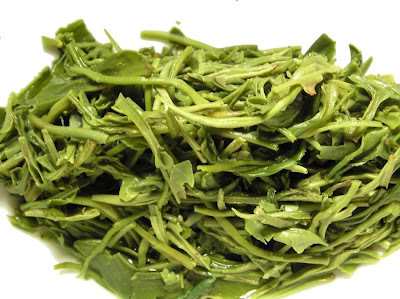 Mao Jian is much more term of grade then name of tea meaning ‘Downy tip’. Immediately after opening the vacuum sealed pack I felt the smell of the tea – dark chocolate with peanuts. I never had tea like this, not with such intensive smell, though I like it very much. It’s nice surprise. The leaves are small, dark green, even and unbroken; most of them are a tip with small top leaf. Because of the size the silver hair aren’t visible. 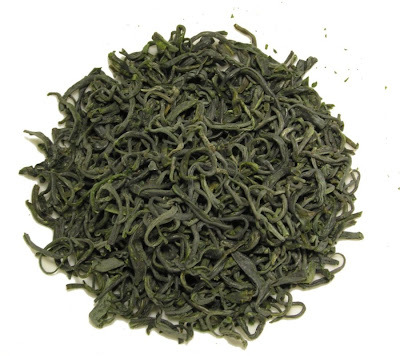 The liquor is greenish because of the chlorophyll, but most of fresh and tender green teas have more green than yellow liquor. The chocolate in smell of the tea vanished; it was replaced with delicate but definite floral and flowery fragrance. Fortunately, the grassy scent did not dominated the brew, so this tea could be savored by irregular tea-drinkers, too. The tea lasted quite a few infusions, cheering me up with the sight of its fresh green leaves. I found this tea being similar to higher quality Japanese sencha. After all, this tea is harvested at Zhenjiang province on eastern coast of China near Japan. I like this tea quite a lot; however it’s quite expensive ($15 per 2 oz) the even taste, number of infusions and high quality craftsmanship makes this tea worth of purchase. I know your blog, I like it a lot. Great reviews and even better photos!